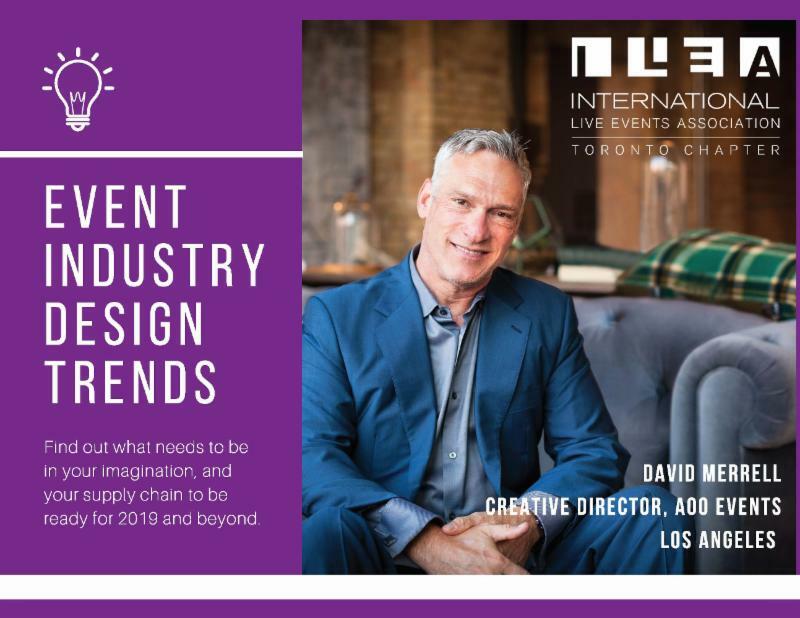 As Creative Director of LA based AOO Events, David Merrell has his finger on the pulse of what's happening in social and corporate events, globally. Covering the areas of design, food and beverage, lighting, technology, and more. His information comes from many sources and he's bringing it all to you in this fast- paced, entertaining session. Find out what needs to be in your imagination, and your supply chain to be ready for 2019 and beyond. Since its inception in 1989, David E. Merrell, CEO & Creative Director of AOO Events, has taken the event industry by storm. With a name synonymous with cutting edge, and innovative event design and production concepts; Merrell has transformed the market, captivating audiences worldwide. For over 25 years, David has been one of the most sought-after producers globally; with a growing list of Fortune 500 and international corporations for product launches, corporate events, celebrity-attended fundraisers, and intimate weddings. Most recently, David capped off another successful Oscar season as Lead Designer for Alfre Woodards' coveted Sistah's Soiree which is an annual dinner for African American women, and women of colour in film. David has served as President of the ILEA Greater Los Angeles Chapter, and sits on the Advisory Board for top industry publications BizBash, and Catersource, as well as The Global Event Forum; a high-level influential international group of live event professionals that discuss relevant topics impacting the live event industry. He has been named "Event Designer of the Year" by Event Solutions Magazine, and awarded the prestigious Crystal CITE Award from the Society of Incentive and Travel Executives, the 2017 ILEA Klaus Inkamp Lifetime Achievement award, and the 2019 Steve Kemble Leadership Award awarded at The Special Event 2019 global conference. Merrell and AOO Events have perfected the art of creating and designing that "wow" moment for each venture they pursue. Continuously leading the market in a forward direction with authoritative momentum, David E. Merrell and AOO Events can respectively be considered a driving force in today's event industry.